Cells often kill themselves for the benefit of their lot. New forms of cell suicide are being discovered every day now. I wrote about apoptosis, which is a rather clean form of cell suicide recently. However, necrosis which until recently seemed to be a an uncontrolled form of cell death, is now being looked at again as a form of controlled suicide. A recent publication by Di Paolo et al in the new journal of Cell Reports sheds some light on on of these rather unusual forms of cell death. The authors call it ‘defensive suicide’. Di Paolo et al. intravenously injected Adenovirus into the mice. They observed that the macrophages (specifically in this paper, liver macrophages) capture the virus particles. However, shortly after the macrophages died of necrosis. Interestingly, they find this phenomenon to be independent from normal mediators of cell death such as various Caspases, as well as inflammatory mediators such as MyD88, TRIF and ASC. They finally point to IRF3, a transcription factor normally activated after certain infections. Macrophages from IRF3-/- mice did not go through necrotic death after Adenovirus infection. 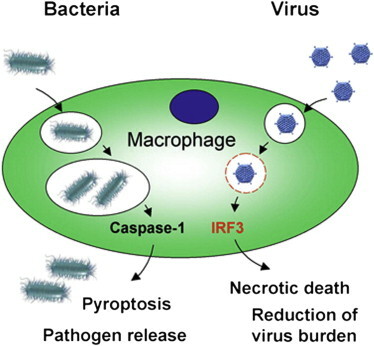 The authors next show the proteins upstream of IRF3 are dispensable for the necrotic death of macrophages and that IRF3 is not phosphorylated at the time of macrophage necrosis, further adding to the enigma of the mechanism. The only clue we get so far is that this mechanism is dependent on escape the of the pathogen from the phagolysosome into the cytosol. They show this by using Adenovirus and also Listeria monocytogenes mutants that cannot escape the phagolysosome. Compared to their wildtype counterparts, the mutant intracellular pathogens do not induce necrotic death of the macrophages. Finally, to see if this necrotic death actually has a benefit for the host, the authors deplete mice from macrophages and infect them again with Adenovirus or L. monocytogenes. They observe that without the macrophages the virus or bacterial burden is a lot higher in the liver. Thus, this mechanism could be a way of slowing down the systemic spread of infection. The macrophages might collect the pathogens that would be otherwise infecting other defenseless cells and destroy them via necrotic death. Would this mean that necrotic death better kills the intracellular pathogens compared to other forms of programmed death? Or they just go through this pathway because other pathways of programmed death are blocked by the pathogens? Considering that necrosis occurs very rapidly (within minutes), the first one seems more likely. This mass suicide of macrophages is a very interesting phenomenon. It also raises many questions that have not yet been addressed. The most obvious question is the signaling mechanism by which IRF3 induces this special form of necrosis. The authors did not find any dependence on the proteins that are usually known to be upstream of IRF3. So there might be a novel mechanism involved. Another question concerns the route of infection. The authors have used intravenous injection both for Adenovirus as well as L. monocytogenes infection. However, these pathogens usually enter the body from the gut or the lungs and then reach the circulation system. Would this defensive necrosis extend to the immune cells in other tissues such the lung or the gut macrophages? Would the route of infection affect the intensity/quality of macrophage necrosis? We will hopefully get the answers in the near future! When designing experiments in the lab, we usually say we cannot check for everything. Well, what if we could?! Meissner et al. used only 150,000 macrophages per sample to analyze their secretome. They have been able to detect and quantify protein abundances at the picogram level in a label-free system. Picogram detection limit means that cytokines are readily quantifiable, and Meisner et al. claim it matches with the detection limit of ELISA. I could imagine that in not so long this technology can become more readily accessible, allowing researchers to acquire more pertinent data per sample. We can know the statuses of a multitude of proteins (from cytokines to nonconventionally secreted proteins) simultaneously, not through multiple ELISAs and western blots, and therefore draw much more sensible conclusions from experiments. It will actually be more affordable than separate quantification of each protein, not mentioning dramatically time-saving. Also, this data can be integrated with other high throughput quantitative analyses of the cell. For instance, Meissner et al. have compared the changes in protein abundance in the secretome to changes in their transcript levels, and roles of different adaptor molecules (in this case MyD88 versus TRIF) and tried to explain how they all relate.